Oh the taste of freshness with basil, garlic, tomato, cucumber, over a soft inside and crunchy outside, parmesan herb bread. You are surely in for a treat with the taste of summer in this plate... This is a Tuscan salad from Central Italy. A 16th century style dish from Italy. The name came from referring to deep dish with stale bread cubes with onions and vinegar over stale bread. Usually a light summer salad. I just love everything about this salad. The bread cubes especially when toasted and turned into garlic bread. The original recipe is made with stale day old bread. The juices sop up the bread and it's delicious. I make it either way. I love olive oil, balsamic vinegar with herbs and spices. Homemade makes all the difference in flavors. Of course it's better the next day if the dressing sits to seep the flavors. I always forget to make the dressing the day before my salad. I usually have this when it's really hot outside. I like a cool lighter meal in summer. Living in Florida, I don't have heavier meals unless it's chilly outside or a rainy day. This isn't suppose to have any other ingredients other than tomatoes, fresh basil, cubed stale bread and dressing. I love to improvise and add all kinds of things I like to it. I usually never add meats but you can if you like. I love mine with cucumbers, mozzarella balls that are fresh from the deli and olives. Make it how you like it. If you read the history on this, it's quite plain but absolutely yummy! A fresh Tuscan salad from Central Italy can be the best new salad you add to your healthy diet. This one is a favorite of mine. 1 cucumber chopped in small cubes not in the traditional recipe but I love them! Cube and cut up all the vegetables into a medium size bowl, fold in the mozzarella cubes set aside. In a small bowl combine the wine, vinegar, mustard, pepper, honey, garlic, salt, cayenne and olive oil. Mix with a wire whisk until it is well mixed and slightly thickened. Pour over vegetable and cheese cubes in the medium bowl and refrigerate for 1 to 3 hours before serving. Cut the bread into 1 inch pieces and toss into a large plastic zip lock bag. Adding olive oil and salt, garlic powder, basil, parsley, oregano and cheese. Toss all pieces until they are well coated. Place on a foil or parchment paper lined cookie sheet. Place in 430 degree oven for 6-8 minutes or until the edges of the bread are golden and crispy but not hard like croutons. Let cool. Note: if you love croutons use this recipe and just cook longer on 300 degrees for around 1 hour turning constantly. Other optional items you can add: sliced carrots, olives, capers, anchovies, celery but this is not traditional to the dish itself. Add bread to a plate, scoop vegetable salad items over the top and serve. I made this the other day but used a garlic and chive bread that I'd made. It's such a good salad. Great photos! So beautiful, healthy and delicious! A lovely touch of summer for January!!! I went to one of those bulk stores and bought a big box of tomatoes and then ended up not making what I planned. I have been trying to figure out ways to use the tomatoes and forgot all about this salad. I definitely see a panzanella in my future. Viva l'Italia!I love panzanella, it is ever so nice. I like your blog and I will follow you. Ciao! Yum!! I am loving your italian salads! I have to get on Lou to start making them. I think I could bribe him with panzanella! Thanks for the recipe! Your salad looks lovely. Wish that I had your tomatoes to make the salad, instead of the pale cardboard tasting ones we have here, now. Will make this salad with local tomatoes in the summer. My mouth is watering. Being the carboholic that I am, this is an old favorite. Great video Claudia. I love Panzanella salad. It's so refreshing, healthy and hearty with the croutons in it. I really like the sound of your dressing. I'll have to try your version. This does look like summer on a plate...love the color and freshness, and that fantastic dressing! Mmm, panzanella :) Lovely! Looks so fresh and delicious! Oh, that is gorgeous! Panzanella is one of the classics that I haven't tackled yet. It looks great! 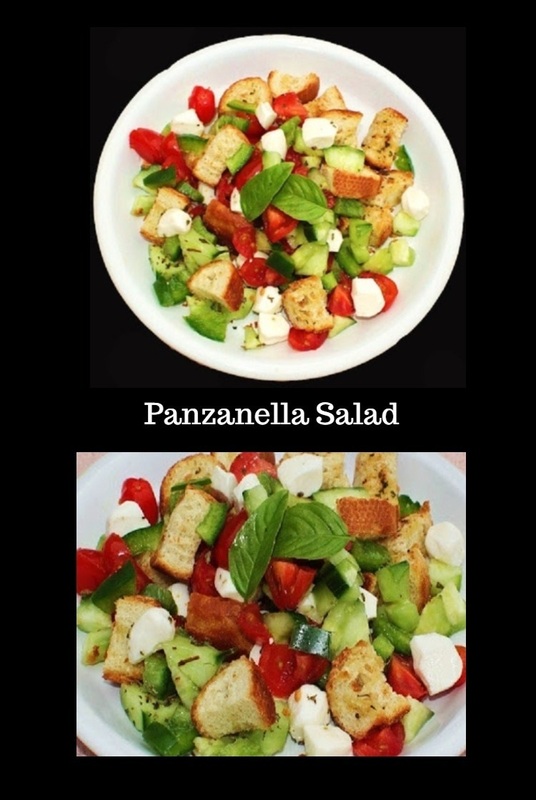 It's great how panzanella has so many variations, like this one! This salad looks so fresh and vibrant-definitely a good one to have for lunch or dinner. There are a lot of choices out there for salads but I would have to say Panzanella is one of the best in my book!